Once is proof that there are people in the world (in Ireland, at least) who still know how to tell a simple story. This small, ragtag independent film is devoid of complicated plotting, enigmatic characterizations, layers of metaphor, and literary flash (which many artists nowadays feel are necessary to GET YOUR ATTENTION). But despite its artistic modesty, Once manages to be the most emotionally complex and gratifying cinematic experience I've had this year and certainly the best movie I've seen in a very long time. Once tells the story of two amateur musicians who meet almost by chance and build a strong and supportive artistic relationship, which in turn fuels their romantic attraction to each other. 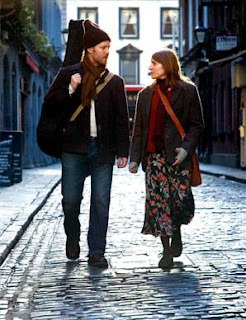 The film, written and directed by John Carney, is both a brilliant exploration of the creative process and a love letter to human connection—no matter what form it happens to come in. Oh, did I mention that, for all its low-budget, handheld simplicity, it also manages to reframe and reinvigorate the movie musical? The songs, written by its two stars (Glen Hansard, frontman for The Frames, and Marketa Irglova), are full of longing and hope, heartbreak and uplift. The final shot of the film (no, I won't ruin it for you), which is the culmination of a simultaneously minor yet epic journey (a contradiction in terms, I know, but it's true), is at once breathtaking, beautiful, sad, and joyous. That's the spirit of the characters, and that spirit shines on every frame of the movie.